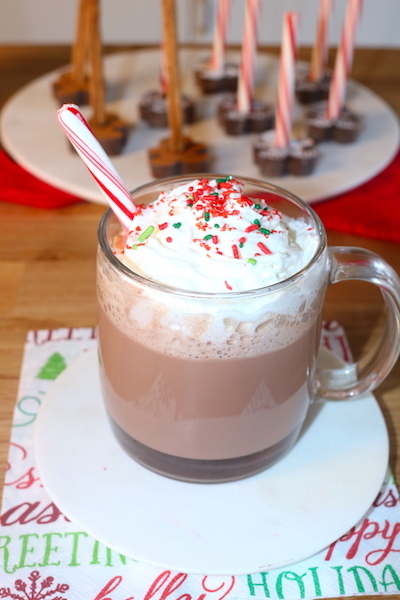 The Best Candy Cane Cocoa Recipe! 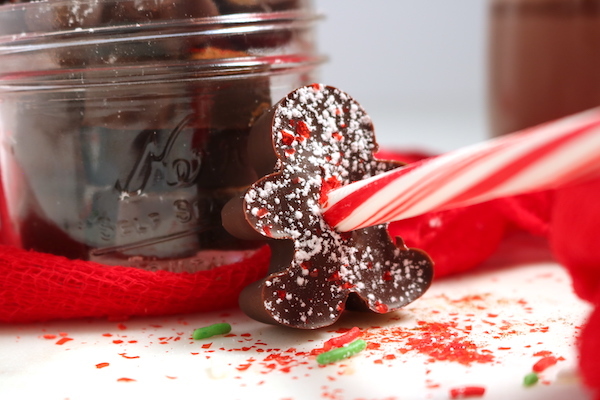 We’re in love with this Candy Cane Cocoa Recipe. 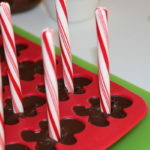 It’s made with real chocolate, and flavored two different ways with peppermint and cinnamon. 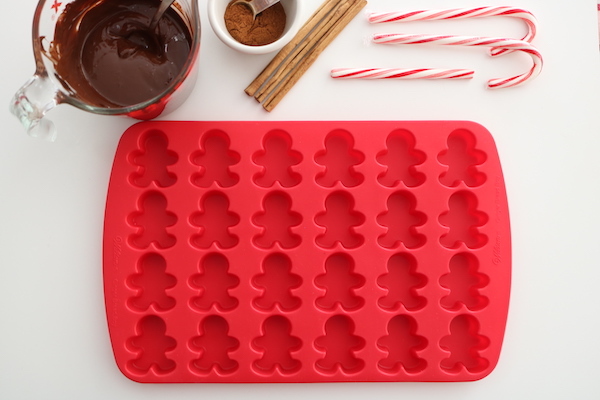 We know this tastes amazing, but what about the gingerbread shapes? Cuteness overload!! 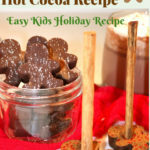 There’s so many ways to make this using a variety of ingredients for chocolatey flavor. We opted for a very basic recipe, but used Callebaut, a high quality Belgian chocolate. The kids made these with ease, and had a blast too. Click here to learn more about Callebaut chocolate. Gain instant access to eBook! "5 Green Smoothies Your Kids Will Love"
Get your kids to enjoy eating vegetables with this freebie! Yes, send me new recipes! I took a chocolate making class when I was in culinary school, and I looooved it! One of my favorite classes. I wouldn’t mind going into the candy making business. My issue is that I have zero will power when it comes to truffles, bon bons, and anything chocolate. 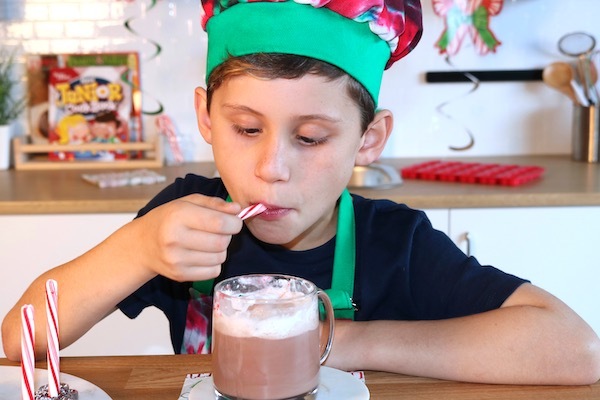 We made more complicated recipes for hot chocolate in the class, and the taste is more for the adult palette. For instance, one of the recipes called for cayenne pepper, cocao powder as well as the Belgian chocolate, and cocao butter. Even though we’re sharing a more basic recipe it still tastes divine. 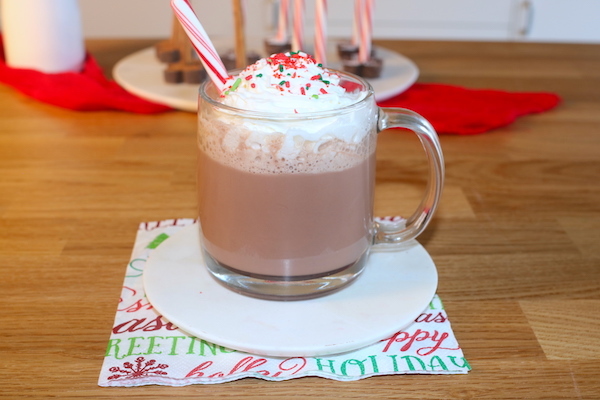 After you make a hot cocoa recipe like this, it will be impossible to go back to those chalky powder packets. Actually, I grew up on those packets and drinking a cup always put a smile on my face. As my love for chocolate grew, so did my taste for rich pure chocolate flavor. I did a side by side taste test with Swiss Miss, and what a shock. It was sweet, and gritty, and you could taste the stale powdered milk flavor. Also, all the gritty sugar bubble rose to the top and I had to press them against the side of the cup to get them to dissolve. Needless to say, it was an eye opening experience. 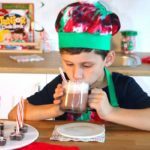 This Candy Cane Cocoa Recipe melts perfectly swirling the chocolate around with the candy cane handle. No gritty sugar bubble on the top. 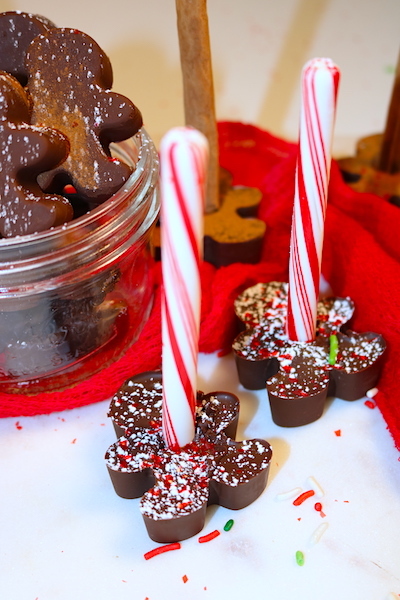 The best part is when the chocolate has melted away, you’re left with the candy cane to eat. Yum! Brody had so much fun with making this, and the best part was a hot cup of cocoa. 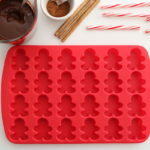 Click here to get the same GINGERBREAD MOLDS we used. Click here for the long CEYLON CINNAMON STICKS. 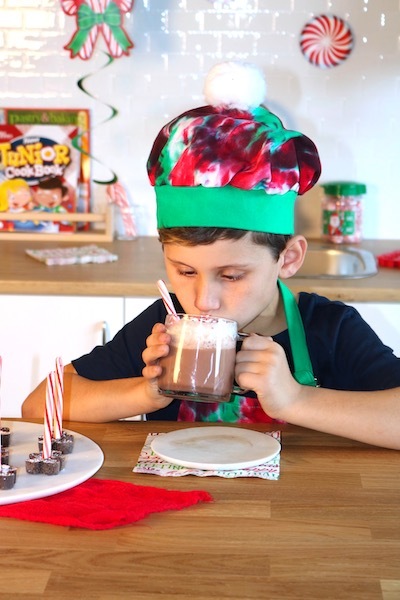 Click here to get he same CALLEBAUT CHOCOLATE we used for this recipe. 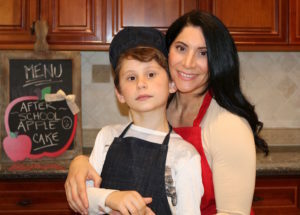 This recipe is so fun to make with the kids! 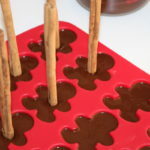 The mold makes 24 stirrer's. We made 12 cinnamon, and 12 candy cane. Divide them how you would like. Also, we made a few without stirrer's and put them in a jar as a gift. Making the stirrers. Break the arches from the candy canes and place them into a baggie. Then crush them into small pieces. 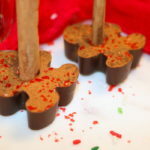 The end of the candy cane stir sticks should d be flat, so they will stay level when inserting them into the chocolate mold. 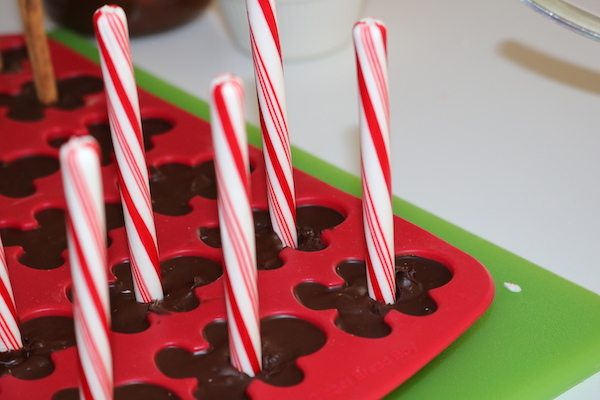 Put the chocolate in a medium microwave safe bowl or cup, and place into the microwave. Microwave on high for 30 second intervals, stirring every 30 seconds. When you see just a few lumps in the chocolate, it is done. Remove from the microwave, and stir until the lumps are all dissolved. 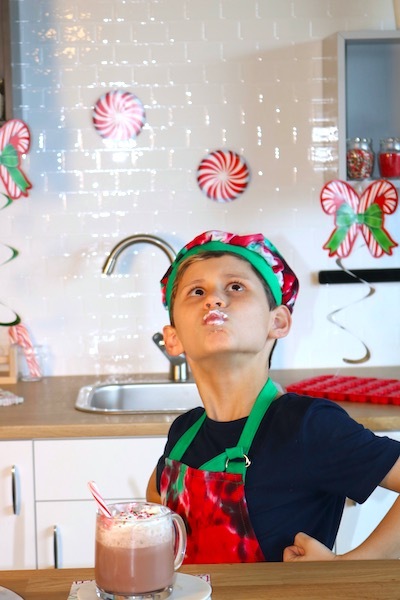 Add the peppermint extract, and crushed candy cane pieces stirring until mixed. 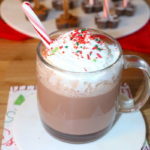 Insert the candy cane into the chocolate, and let it set before removing. Once they've set, they will pop right out of the molds. Sift the powdered sugar on top, and sprinkle with the red flakes. Pour the milk and Half & Half into a small saucepan. Heat until you see small bubbles start to form on the side of the pot. Remove from heat, as you don't wan't the milk to boil it becomes a little grainy. Pour into a cup, add the stirrer swirling until melted, and a little whipped cream to the top. Add the cinnamon to the melted chocolate, and stir until dissolved. 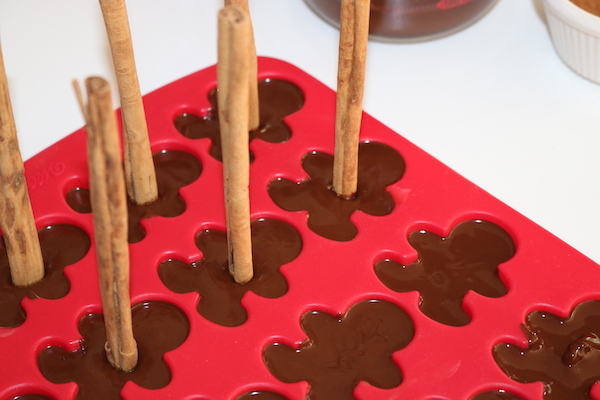 Spoon the chocolate mixture into the molds, and add the cinnamon stick. 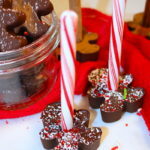 (The chocolate doesn't need to harden for this recipe, since the cinnamon sticks are much lighter than the candy canes and will stay in place. Let them set, and as soon as they harden they can be popped right out. 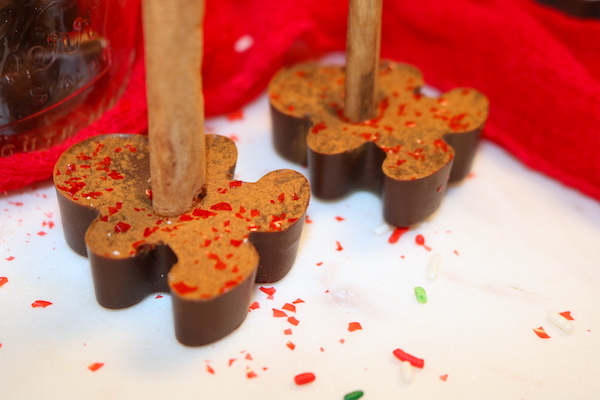 Sprinkle with cinnamon, and the red flakes. They are ready to be stirred into a hot cup of milk. Use a good quality chocolate bar, or chocolate morsels. 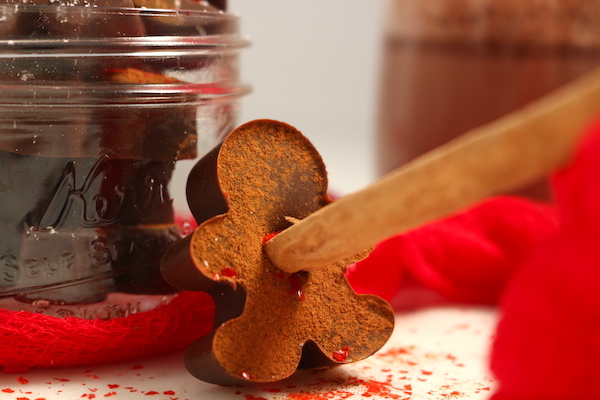 For this recipe we used dark chocolate. Milk chocolate is a good option as well, but it will be a bit sweeter.